Your donor is the hero. This is one of the hardest concepts for nonprofit staff to accept. They want their frontline staff to be the heros. They want to recognize the beneficiaries as the heros. Both are true, but in the context of fundraising, your donor is the hero. In this episode, Jeremy answers a question about how to position the donor as the hero in your nonprofit communications. 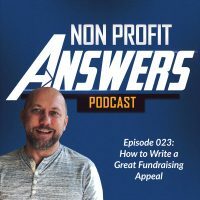 Using examples, Jeremy teaches you how to write active copy that presents an appeal from the point of view of a donor. Positioning the donor as the hero in your communications is simultaneously the most effective way of improving fundraising and one of the more difficult concepts for your staff to accept. Many of your staff want to position the people who have a direct connection to your beneficiaries as the heroes, or even the people you serve as the heroes. The good thing is, they are right. All of these people are heroes. The problem is, in the context of fundraising, your donor is truly the hero. This concept has been around in fundraising circles for decades. Recently, Donald Miller popularized the concept in the for profit world, about positioning your customer as the hero, through his training and through his book, StoryBrand. The concepts in StoryBrand can be directly transferred into your work with donors. StoryBrand tells you that they will help you clarify your message, so your customers will listen. So you can insert “donors will listen” in there, as well. It is a process that helps you understand your donor as the hero and you as the guide. This concept is the foundation for most successful stories. Consider Star Wars for a moment. Luke is the hero of the story, while initially, Obi Wan is his guide. Compare this to your nonprofit. Your donor is the hero, Luke, and you are Obi Wan, leading them to destroy the Death Star. You’re leading the hero to fulfill his desire, to give to an organization, to fight for a cause he believes in, like ending poverty or improving arts in your local city. In today’s question, Jeanette asks about how to position the donor as the hero. We will walk through what it means and the practical ways you can demonstrate that the donor is the hero in your communications. Hi, Jeremy. My name is Jeanette, and I’m a new fundraising specialist at the food bank near Tulsa, Oklahoma. I have been reading a lot of blog posts about fundraising, and a couple of places, I’ve seen the phrase, “The donor is the hero.” I get the concept, but can you explain how that works in our communications? How do we position the donor as the hero, without it sounding forced? Thanks so much in advance. Thanks so much for your question, Jeanette. I know that’s a difficult concept for staff to understand, that they are not the heroes, that the beneficiary is not the heroes, but instead, that the donor is the hero. There’s a natural inclination for us to talk about ourselves. There’s a natural inclination as a nonprofit to discuss the great work that you do, because you do great work. The problem is, is that when we tell our story, and not the story through the eyes of the donor, the donor has a hard time seeing themselves in the shoes of the person making the difference, and in the shoes of the person making the difference in the cause that they believe in. They’re using your organization almost as a tool to fight for a cause that they believe in. Maybe it’s a cause that they have a family connection to, maybe it’s a cause that they just have a passion for, but whatever the reason, the donor wants to be the hero by solving a problem that they have a passion to solve, and they’re using your organization as a conduit to solve that problem. And that’s a good thing. Your staff members, your beneficiaries, they are heroes. They’re just not heroes in the sense that we need them to be for fundraising. What we need to do is we need to tell the story of our cause and what we’re trying to achieve through the eyes of the donor, so the donor can see themselves as the hero in the story. We use the words “we” and “I” a lot in our copy. We talk about ourselves, and that’s just a natural inclination as a nonprofit, to do that. You’re involved in that, day to day. You’re seeing these great stories of the impact that you’re making, and the natural thought is, we can tell these stories, we can tell the great work that we’re doing. The problem is, is that we need to tell the point of view of the donor. See, what’s wrong with talking about the “I”s and the “we”s a lot, instead of the “you” and “your” a lot? Well, the potential donor that we’re trying to reach, they have a story, and they’re living that story right now. They’re the hero of their own story, and when they hear our story and we position ourselves as the hero, what they see is another hero doing good work, but what they don’t see is an opportunity to connect with you as a nonprofit, and to be a part of your story. You see, you’re both heroes then, in their view. But when you position yourself as the guide, then you position yourself to help the journey of the donor, to reach the goal that they want to reach. And so the passion that the donor has is for your cause and is to be a part of the journey that they’re living out, as a hero in their own story. When you position yourself as a guide instead of the hero, then you can reach the donor where they’re at, which is on a journey through their life story, and helping your nonprofit is a part of their life story. In other words, as the guide, you help the potential donor fulfill his passion for your cause. So when you use the language from the point of view of your donor, then he can see himself giving to your organization. He can see the impact that his donation is going to make in your organization. So here’s an easy rule of thumb when you’re writing copy; you should use the words “you” and “your” a lot more than you use “I” and “we”. When we use “I” and “we”, then the donor who’s reading that copy really is reading it from the point of view of the organization and the good work that you’re doing as an organization, and he doesn’t see the need for him to be involved. But when you use “you” and “your”, then you position the copy in the point of view of the donor, and the donor becomes the one that’s being active in fighting for that cause or solving that problem. So let’s go through a couple of examples. Let’s say that you wrote, “This past year, we’ve served 12,500 people with job training assistance.” It’s a great statement, it’s a great outcome of your work, it’s great that you’re doing that. But instead, what if you wrote it this way, “This past year, you’ve provided jobs training assistance to 12,500 people”? So instead of your organization being the hero that caused that to happen, the person reading the copy feels like they’re the hero that caused that to happen. Or how about this statement, “We have a goal of raising $15,000 before month’s end, so we can help 300 families by year end.” Instead, what if we wrote it this way, “You can help 300 families by year end, by giving a gift towards a $15,000 goal”? Not only have you changed the language to positioning it from the point of view of the donor, but you’ve also changed the language to be much more active, so the donor can feel actively involved in your cause. Here’s another example, “Then we helped change Maria’s life with education, healthcare, and clean water.” You could rewrite that to be, “Then you changed Maria’s life with education, healthcare, and clean water.” The same statement, just said in a way that positions the donor as the active participant in helping Maria. Do you hear those differences in language? Not only did we switch out the phrases to use “you” and “your”, we also used more active language in those statements. Put the donor in the shoes of being the hero, and tell the story that the donor actively helped solve the problem. So what are some of the communications that need to change? Anything that your donor will read or see. So this could be appeals, your website, annual report, videos, social media, your blog, newsletters. Really, any kind of copy that is going to be put in front of a donor, should you use really donor-centric language that puts them as being the hero of the story, and uses active language of them changing the lives of your beneficiaries. It’s really important for your donor to see himself as the hero in your communications. Thanks so much for the question, Jeanette. I hope that helps you as you write copy, and move forward in writing your appeals and other pieces of communication, that you’re able to position the donor as the hero of the story, so they can see themselves actively helping solve the problem, and that they will join you and your cause, as you guys fight to end whatever it is that you’re working towards, that the donor will help contribute towards that, and they’ll see then a successful part of the story then involves both you and them. Take care.